Since 1971 Holloway Company has provided tube bending, bending of pipes, bar bending, beam bending, structural steel bending and plate rolling for OEMs and construction projects. We feature fabrication of structurally formed alloys, including tank manufacturing, plate rolling, angles, bars, bricklintel, pipe & tubes. 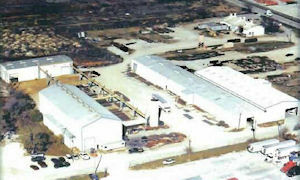 Holloway Company Inc. leads the way as an industry leader in structural forming. We've built a solid reputation for integrity and reliability. We approach business with our customers' needs in mind offering the best quality products and services available. With the addition of "R15S", The World's Largest Angle Roller, we have enhanced our capabilities and equipment, so our roll shop can custom form most types and sizes of structural shapes. We offer the latest technology for precise structural forming, so you can be assured that Holloway will meet your custom order's exact specifications with accuracy and efficiency. Holloway Steel Services is one of the premier steel fabricators serving customers in Texas, Oklahoma, Arkansas, New Mexico, Lousiana, Colorado, Arizona and nationwide. We have been involved with projects such as the San Diego Airport, the American Airlines Center in Dallas, Texas, the Aria Las Vegas Resort and Casino, the Rosa Parks Bus Station in Detroit, Wynn Las Vegas Resort and Casio, the MGM City Tram Station in Las Vegas, Love Field in Dallas, Texas , the United Nations in New York City, the Arizona State University Skyway as well as overseas projects in Trinidad and the Bahamas.